100 Puzzle Quizzes (Interactive Puzzlebook for E-readers) - Kindle edition by The Grabarchuk Family. Humor & Entertainment Kindle eBooks @ Amazon.com. Discover the 1st volume of the Top Rated Puzzlebook: Puzzle Quizzes series, version for e-readers. In this brand-new puzzle collection you will find 100 pictorial, hand-crafted puzzle quizzes in different themes: logic, visual, spatial, counting, geometry, matchstick, coins, searching, and much more. Over 700 000 downloads of the Puzzlebook series! Discover why thousands of puzzle solvers are addicted to Puzzlebooks. All puzzle quizzes are original creations by the Grabarchuk Family and were carefully crafted and tested by our team. Get 100 Puzzle Quizzes HD to enjoy entire new colorful experience playing Puzzlebook on Fire Tablet, iPad, iPhone, Android, PC, Mac, or other devices using a free Kindle app. For the first time Kindle Puzzlebook contains color high-definition images - four times bigger images compared to the previous version. Now each puzzle looks perfectly sharp and detailed with richer colors. Do you like to solve puzzles on a paper? Or you are looking for a great gift? 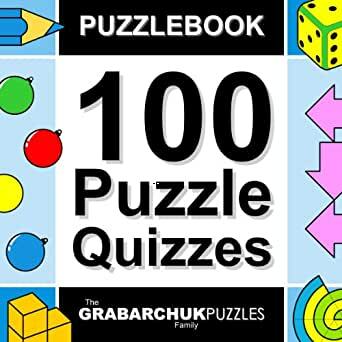 Just get new 100 Puzzle Quizzes paperback version. Length: 72 pages Matchbook Price: $0.00 What's this? 5.0 out of 5 starsA pleasing puzzle book to test how your brain is wired! It is made especially for E-readers! Are you good at math and geometry but have difficulty with words and graphic designs? Can you calculate the volume of objects, crack a code or even pick out why one object is different from others even if the difference is subtle. This puzzle book is not only a Mensa type challenge but also you can clearly see how your brain is wired and what your mental strengths and weaknesses might be. This version of the book is for E-reader devices and contains black and white images. Each puzzle is designed to load fast on E-readers and the graphics are sharp and simple and easy to interpret but sometimes not easy to solve. That's why it is a puzzle book. I enjoyed this book and I believe you will enjoy it too! I purchased this book on the day it was released and free to everybody. This is the e-reader version of the Grabarchuk 100 Puzzle Quizzes. It is a fun and thought provoking book of puzzles that will entertain families for many hours. All 100 are original inventions. There are two versions of the puzzles. One is optimized for e-ink kindles. The other is for tablets. Both have the same contents. There is an elaborate introduction and an easy to understand instruction "How to Play the Games." The 100 puzzles are of all kinds and figures, logic, visual, counting, matchsticks, coins, and much more. The puzzles are easy to read and understand, and the solutions to them are easy to find. Each puzzle has from one to five stars indicating how difficult it is. One can go to the list of puzzles and choose which puzzle one wants to try. The following are some examples: The thirty seventh has three stars indicating that it is fairly hard. It shows a design made out of lines and asks which of four words could fit into the deign? Number thirty eight shows a picture of steps running along the outside of a square and steps within the square and asks "what is the least number of steps needed to reach floor F?" The hundredth puzzle, like three others, has five stars. It shows two columns of three dice in each. It asks "which tower shows the larger sum of total outer surface?" See my review of the tablet version for other examples. Although there are plenty of word puzzles of all sorts available on Amazon, either as books or Kindle apps, visual puzzles are fairly rare. The Grabarchuk family has assembled 100 of these puzzles of varying degres of difficulty in a book that's not surprisingly called "100 Puzzle Quizzes," and it's a book that practically all the members of a family can enjoy, from elementary school on up. Since some people might be unfamiliar with what the Grabarchuks refer to as a "puzzle quiz," some explanation might be in order. These 100 puzzles all involve visible objects, usually geometric shapes and patterns of various sizes. Each puzzle occupies a separate page in the book, and readers need to examine the object or objects on the page carefully and figure out the answer to a question about the objects. In some puzzles, readers are asked to identify which of three or four views of an object from different angles represents a different object from the others. 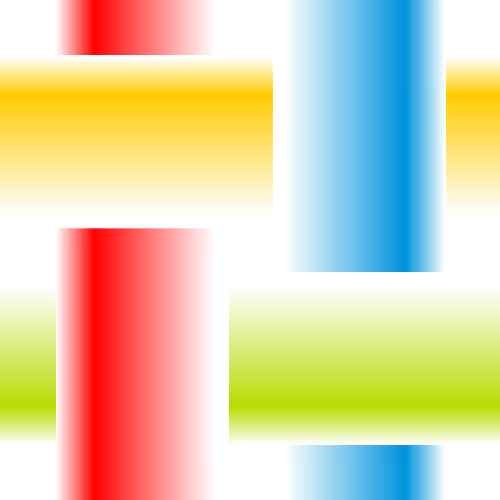 In other puzzles, certain portions of an object are dark and the remainder are white and readers are asked which color represents the larger percentage of the of the object area. Still other puzzles ask readers to determine how many squares or triangles of any size are contained in a large grid. My explanation is actually more complicated than the puzzles themselves. Readers can check out the sample on the Amazon page for "100 Puzzles" to get a better idea what some of the puzzles are like. While the puzzles themselves seem fairly straightforward, figuring out the answers can be tricky. Each puzzle has several (usually three or four) possible answers. If a reader clicks on an incorrect answer, he or she is redirected to a "frowning face" emoticon and can return to the puzzle page to try again. If a reader clicks on the correct answer, the page contains an explanation of why that answer was correct. The book's linking structure makes it virtually impossible for readers to inadvertently spoil a puzzle they haven't tried yet by revealing the correct answer. All of the puzzles contained in "100 Puzzles" can be solved by some combination of careful observation and spatial recognition, logic, and mathematics. The authors rate each puzzle from one to five stars in order of difficulty, but most of the puzzles are two- or three-star puzzles. Good high school students should be able to solve the three-star puzzles, while some of the tougher puzzles can be quite challenging for many adults. As a result, this is an excellent book for the entire family, one that is both educational and entertaining. I received this book for free as a promotion, but the authors normally sell it for 99 cents. At that price, I think it's a bargain. Most people will probably want to take their time working on the puzzles, especially if they find the puzzles particularly challenging. Trying to go through the book too quickly will likely lead to resorting to guesswork in frustration rather than trying to carefully work out a puzzle. Most readers, though, will take their time and have a well earned feeling of accomplishment for figuring out some of the trickier puzzles. Although, admittedly, there aren't many books of this nature available on Amazon, "100 Puzzles" is one of the best, and most challenging, that I've encountered. This book is only the first in a series that the Grabarchuks have available on Amazon. I have a feeling that I'll be trying some of those other books out as well. "100 Puzzles" is one of those rare game books that truly is "fun for the whole family." You’re given something to look at and multiple choice answers to figure out what you need to do to complete a variety of puzzles. If you guess wrong you go back to the puzzle and try again. Once you guess right you are taken to the answer and can continue from there. Some are challenging, some I had no problems with and others I’m just clueless on as we aren’t always given an explanation on WHY something is correct. Of the ones I’m clueless on, we’re never shown a how or why, just that this is the right answer. While I enjoy stimulating my mind, it would be even more stimulated by learning something new. Show me why something is right so I know what to look for on the next one. Played half of this on my Kindle Paperwhite and the other half on my Kindle Fire. Didn’t realize the screen was being broken up into pages on my Paperwhite until I played this on my Fire where I saw an entire page at once.